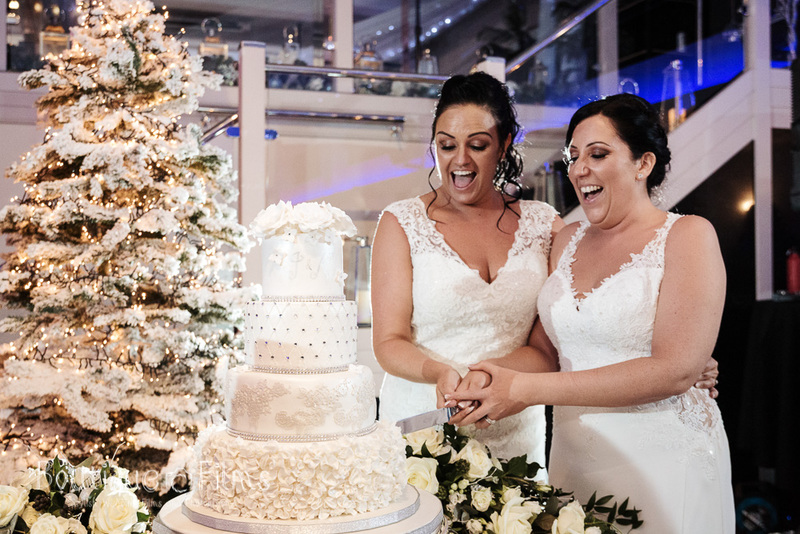 We love a big, seasonal wedding at The Arlington, and they didn’t come bigger or more seasonal than Jodie and Nicole’s wedding on 22nd December 2018. Jodie and Nicole held their engagement party with us in March 2017 wanted the venue for their wedding as well! 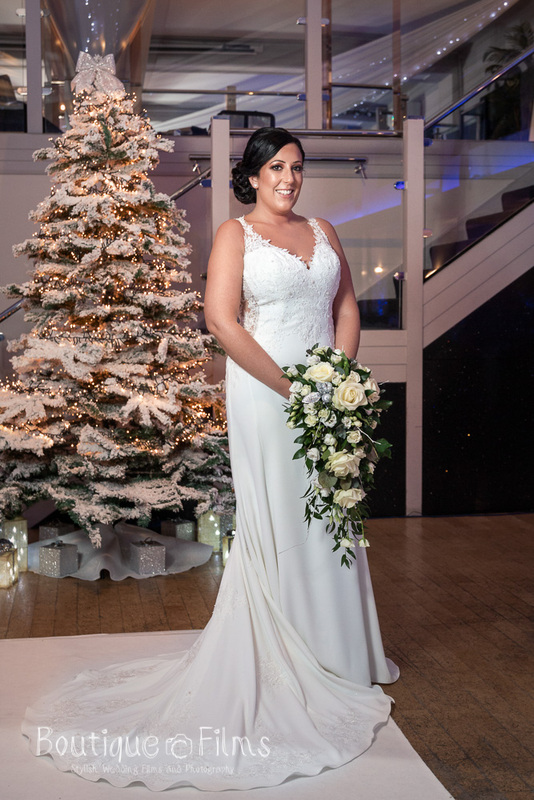 As the big day was the last Saturday before Christmas, the brides chose quite a traditional wintery, Christmassy theme, mixing stunning white and blue sparkling decorations with some natural features including pine cones and a stunning Christmas tree. The styling was by Scarlett Heart Weddings & Events, who did an absolutely fabulous job, while the gorgeous flowers were by Courts of Rayleigh. A big thank you to Yvette and the Events team for putting the whole day together as well! The whole day was a busy one for our staff, especially as we had just hosted several weeks of Christmas parties and were holding Christmas Day Lunch a couple of days later! Everything went smoothly and Jodie and Nicole were both beautiful brides - it was a really emotional and wonderful day that we loved being a part of. All these wonderful photographs were taken by Boutique Wedding Films. Have a browse! 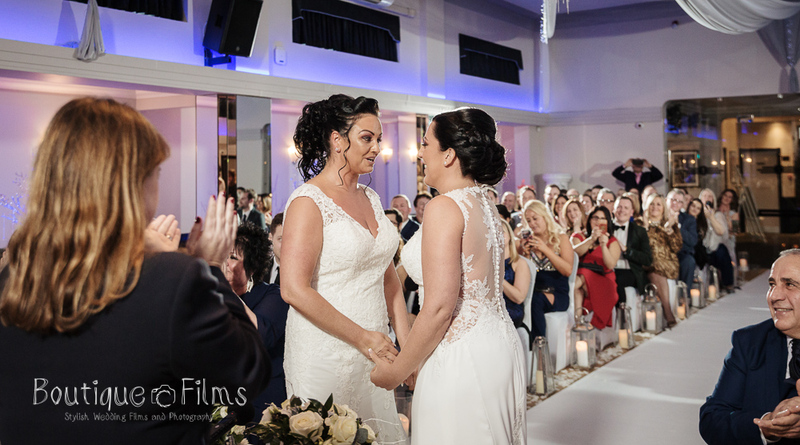 Jodie and Nicole’s wedding was so fabulous it was featured in G Wedding Directory in March 2019! Are you interested in holding your wedding at The Arlington Ballroom? Visit our weddings page to find out more about what we offer, then drop us an email on info@thearlingtonballroom.co.uk or call 01702 711 350 (10am-4pm weekdays). Humanist weddings are increasingly popular, as non-religious or multi-faith couples wish to celebrate their wedding somewhere other than a religious building or a simple registry office. But what exactly is a humanist wedding? Simply put, humanist weddings are non-religious, or secular. There aren’t any rules per se, so couples can tailor their wedding to their exact specifications! Are Humanist Weddings Legally Binding? As of 2018, humanist weddings are not legally binding in England and Wales and couples require a civil ceremony as well as or alongside their humanist ceremony. Humanist weddings are legally binding in Scotland and Northern Ireland, and activists are pressing the UK government for change in England and Wales. Are Wedding Vows Allowed? Is Music Allowed? What is Allowed at a Humanist Wedding? Anything is allowed! You can have poetry readings, live music, a speech from a friend or loved one. You can write your own vows, incorporating your favourite music or poetry, or even incorporating something from a religious text that you do like. You can include elements of ‘traditional’ weddings - the white dress, bridesmaids, a bouquet… or not! It’s really up to you and what you want: a big appeal of humanist weddings is the bespoke element. Whether you’re an LGBT couple, a multi-faith couple or simply looking for something that isn’t ‘a church wedding’ or ‘a ceremony at a registry office’, you can tailor your wedding to you, as a couple. Although popular in countries like Australia, the term ‘celebrant’ isn’t very well known in the UK. A celebrant is the person who conducts the ceremony, often writing or creating the ceremony. You can find a celebrant using Humanist.org.uk’s interactive map. You can also learn more about what celebrants are with Humanist.org.uk’s guide. Can a Humanist Wedding Take Place Outside? Yes! As we said, humanist weddings are not legally binding in England so you will have to have a civil ceremony as well. Where Can I Have a Humanist Wedding in Essex? Pretty much anywhere! Some people choose the beach, some choose their front room, some choose a traditional wedding venue. At the Arlington Ballroom, we’re always happy to host a humanist wedding! We’re also licensed for civil ceremonies, so you can always have a registrar conduct your legally-binding ceremony alongside all your preferred ‘humanist’ elements. We also host wedding receptions, so you can hold your wedding underneath one roof! You can learn about our wedding packages and what we offer on our Weddings page.